New bars (2018) used frame. Call or email before making a purchase for availability and freight costs, Thanks! Contact me directly if you are interested in this marimba or have any specific questions. Happy to help anyway I can. The frame is used & the bars are new from Yamaha. Beautiful sounding marimba. Big huge sound! Perfect working order. No buzzing or broken parts. Just some minor cosmetic wear. All original frame parts go together. Just the bars have been replaced. This YM6000 (frame) was owned by Capital University. The entire keyboard was replaced because the originals were used on other marimbas or broken over the years. Bob Breithaupt (Capital University) arraigned getting a new Yamaha marimba for the school. After replacing the YM-6000, a student was able to buy it (just the frame) from the school in an attempt to make his own marimba. 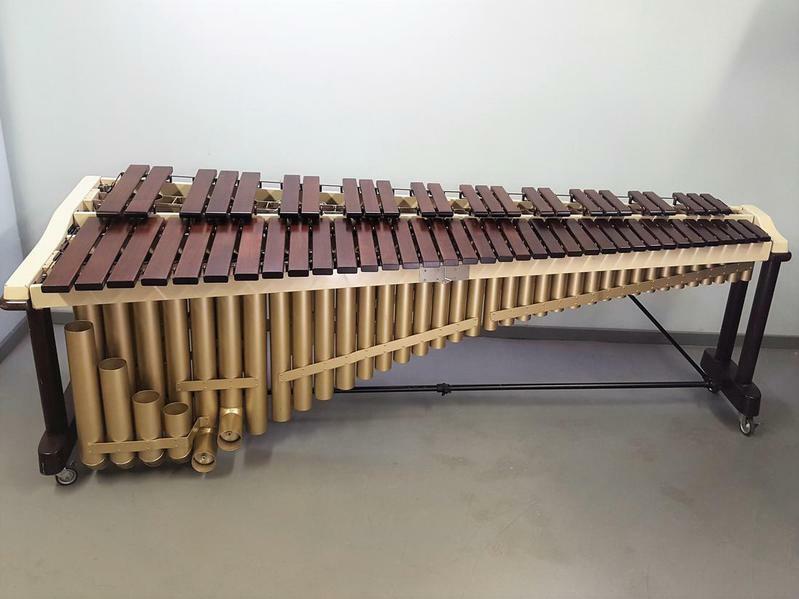 After making his marimba using other Musser parts, he and Fall Creek partnered up to make this YM-6000 whole again. This marimba just received a full set of brand new bars (from Yamaha) in 2018! Basically; the frame is used & the bars are new. This is a beautiful marimba and perfect for someone who needs an exceptional marimba, that will never need upgrading for a great price. The YM6100 (height adjustable model) sells for over $17,000! Some minor cosmetic wear, mostly on the corners and sides of the frame from the marimba being moved. See Photos for more details. Feel free to call or email with questions or to request a freight quote. Bar Sizes: Graduating from 1 5/8 " – 3 1/8" x ¾ " – 1"
Dimensions: 108 ½" x 45 ½"
The YM-6100 (same bars as the YM-6000) is a 5-octave rosewood marimba designed in conjunction with world-renowned marimba legend Keiko Abe. The YM-6100 is the culmination of over 40 years of instrument development with Ms. Abe and is the industry-leading flagship for all Yamaha marimbas. Features include 5 Octave range with Tuned Partials, Graduated Rosewood Bars, Forward Facing Tunable Resonators and Strengthened Cord.